In a diploid genome without CNVs, each SNP genotype call is composed of two allele calls from two homologous chromosomes. If using A and B to denote the two possible alleles for a diallelic marker, then the three possible genotype calls are AA, AB and BB, respectively. As we can see, when there is a 3-copy CNV, there are four possible SNP allele composition within the CNV, including AAA, AAB, ABB and BBB. For each location in the genome that have a genotyped SNP, the CNV-based SNP genotype call can be inferred from the B Allele Frequency values. The above figure does not show deletion, but it is obvious that when there is a single-copy deletion, the two possible CNV-based SNP genotypes are A and B, respectively. Note: I did not use the term "CNV genotype" in the above description. Practically, "CNV genotype" is better used to describe the CN state of two homologous chromosomes; for example, in a common CNV region, a CNV genotype can be 1+0 or1+1 or 0+1. This term has nothing to do with the actual SNP allele composition within the CNV. The boxes below each individual in the pedigree denote the BAF values in the CNV region, and each blue dot represent one SNP in the corresponding individual. The different colors (cyan, yellow, orange, green) for the SNP alleles denote different homologous chromosomes. There are a total of four parental chromosomes, and the allele transmission pattern is inferred, based on the pedigree structure, the CNV calls, as well as the signal intensity values for each of the six children. To make this a little more clear, we can examine the first SNP in the figure. The father (subject 2, with 3-copies) has a SNP allele composition of AAB, while the mother (subject 1, with normal 2-copy) has a SNP allele composition of AA. There are two major possibilities for the father: maybe the SNP allele composition is AA+B in two homologous chromosomes, or maybe it is A+AB in two homologous chromosomes. Without offspring data, we would not tell. However, based one child (subject 4), who has a SNP allele composition of AAB, we can confidently tell that the father should have A in one homologous chromosome and AB in the other. Similar logic can be applied to other SNPs and other offspring in the family. In the command, eight signal files are provided, and the --allcn argument is provided with eight digits, corresponding to eight CN estimates for these eight files. De novo CNVs (those in offspring but not in parents) are especially interesting in many family-based studies, since many people take for granted that de novo CNVs are the culprit variants responsible for diseases in offspring (which may or may not be correct). PennCNV provides a trio-based calling algorithm that helps eliminating false positive de novo CNV calls, when the father or mother has the CNV but was missed from individual-based calling algorithm. However, since de novo CNVs are very important to study, in many cases, researchers want to have even higher confidence in de novo CNVs for selection of CNVs for expeirmental validation. Therefore, PennCNV provides a special script for the sole purpose of assigning P-values to de novo CNV calls. Family information can be also used to extract more biological knowledge from detected CNVs, such as inferring the parental origin of predicted de novo CNVs. 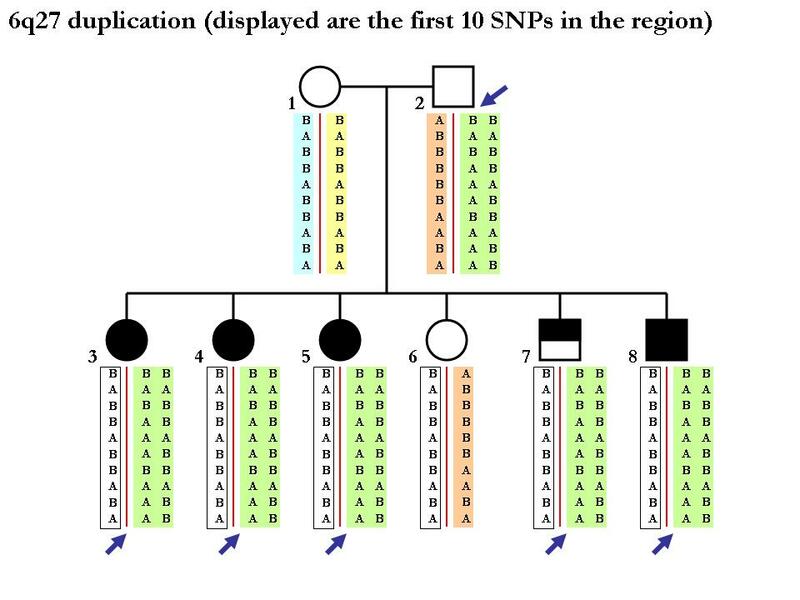 To illustrate this, consider a scenario where the father and mother genotypes at a SNP marker are AA and AB, respectively, and the PennCNV algorithm identified a de novo deletion in the offspring encompassing this SNP. If the offspring genotype call is BB (or when B Allele Frequency indicates that the actual genotype is B in the presence of “No Call” genotype), we can infer that the de novo event happened on the paternal chromosome. Similarly, when the father, mother and offspring genotypes are AA, BB and AA, respectively, we can infer that the de novo event happened on the maternal chromosome. So let us take a look at the above example with 50 SNPs within the CNV region in all family members. 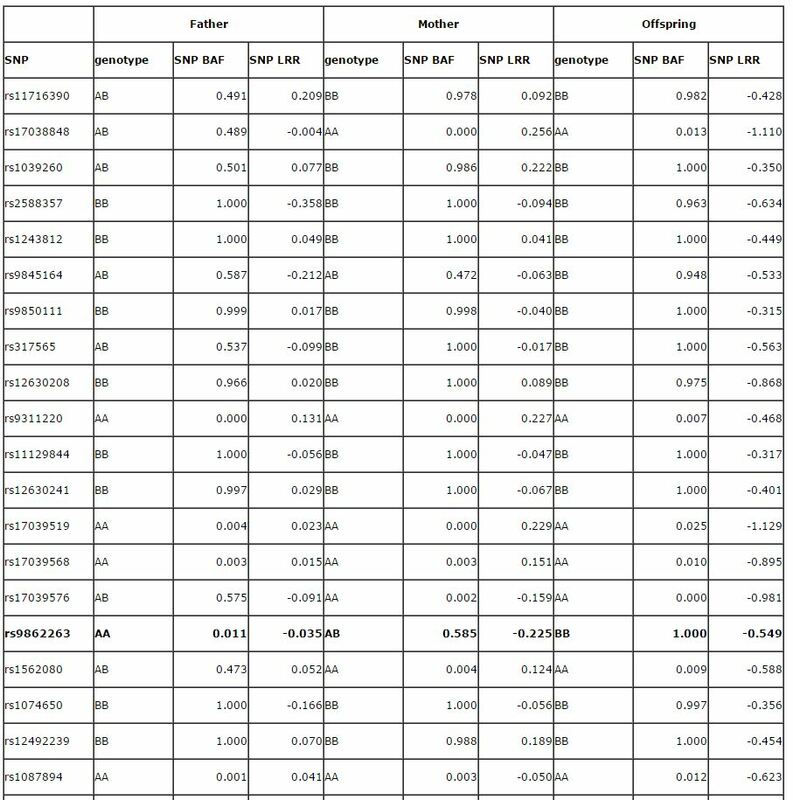 A total of 13 SNPs are informative for this analysis and they were marked in bold fonts. We can unambiguously determine that the de novo event occurred on the paternal chromosome for all 13 SNPs, and on the maternal chromsome for ZERO SNP. If we do a binomial test (against expectation of 0.5), we would have a two-sided P-value of 0.0002, which means that it is highly unlikely to be a random observation. Therefore, we have high confidence that the predicted de novo CNV is a bona fide de novo CNV. rs11716390 0.2092923 0.09235584 -0.4278845 0.4907618 0.9784126 0.9822458 AB BB B ? rs17038848 -0.004215824 0.2558437 -1.109897 0.4892911 0 0.01307535 AB AA A ? rs1039260 0.07700891 0.2215091 -0.3504313 0.5013204 0.9855123 1 AB BB B ? rs2588357 -0.3579353 -0.09411527 -0.6344969 1 1 0.9628402 BB BB B ? rs1243812 0.04895722 0.04061332 -0.4493185 1 1 1 BB BB B ? rs9845164 -0.2121677 -0.06280199 -0.5333947 0.5868546 0.4724992 0.9484559 AB AB B ? rs9850111 0.01715749 -0.04008884 -0.315464 0.9993086 0.9983963 1 BB BB B ? rs317565 -0.09888031 -0.01671213 -0.563325 0.5369598 1 1 AB BB B ? rs12630208 0.02047303 0.08898977 -0.8683601 0.9662933 1 0.9748526 BB BB B ? rs9311220 0.130745 0.2272046 -0.4676653 0 0 0.007175446 AA AA A ? rs11129844 -0.05558765 -0.04681602 -0.316947 1 1 1 BB BB B ? rs12630241 0.02908731 -0.0665196 -0.4010261 0.9974409 1 1 BB BB B ? rs17039519 0.02282252 0.2286292 -1.129272 0.003655733 0 0.02502375 AA AA A ? rs17039568 0.01544927 0.1511088 -0.895263 0.003425092 0.002528912 0.00989458 AA AA A ? rs17039576 -0.09121598 -0.1585987 -0.9806429 0.5749596 0.001887937 0 AB AA A ? rs1562080 0.05211602 0.123653 -0.5881565 0.4732358 0.003651135 0.00945395 AB AA A ? rs1074650 -0.1655274 -0.05582133 -0.3558519 1 1 0.9966652 BB BB B ? rs12492239 0.07033561 0.188675 -0.4542632 1 0.9884533 1 BB BB B ? rs1087894 0.04098149 -0.05005331 -0.6233126 0.0007424421 0.002794209 0.01204688 AA AA A ? rs1110797 -0.02469384 0.1499064 -0.9702201 0.005881125 0.5785041 0.02985496 AA AB A ? rs9848430 0.109309 0.06018361 -0.4467264 1 0.9935361 0.988888 BB BB B ? rs4685724 0.03039831 -0.007138185 -1.084088 0.008211668 0.01290762 0.03060648 AA AA A ? rs12490386 0.2357802 0.334967 -0.8102222 0.009186696 0.003135221 0.02083603 AA AA A ? rs317616 0.168556 0.3524278 -0.5088452 0.4783121 0.006433696 0.01094362 AB AA A ? rs13099728 -0.04942596 -0.1408342 -0.9054488 0.003269672 0.5480256 0.02916644 AA AB A ? rs6806504 -0.1895185 -0.1128018 -0.9621779 0.5175876 0.5209588 0.06420068 AB AB A ? rs6806903 0.06371289 0.01157832 -0.6604852 0.4700137 0.5162509 0.01794186 AB AB A ? rs1092733 -0.05251021 -0.05069277 -0.5229827 0.5304774 0.5244294 0.9770416 AB AB B ? rs317605 0.01646624 0.1212866 -0.9060447 0.4989983 0.0006349169 0.01630653 AB AA A ? rs10865894 -0.2042709 -0.1140895 -0.9258857 0.5329113 0.5048889 0.002666625 AB AB A ? rs317606 0.1008998 0.2956575 -0.5718818 0.4711365 0.002418167 0.01234875 AB AA A ? rs7624815 0.003270485 -0.087667 -0.5803361 1 0.9977139 0.989744 BB BB B ? rs1987888 -0.01560016 -0.170958 -0.7969466 0.4926481 0.5152871 0.004902103 AB AB A ? rs9877622 0.06223465 -0.01536013 -0.313483 0 0.003593371 0.003163114 AA AA A ? rs17039739 -0.234773 -0.1578492 -0.8131365 0.01042593 0.01311021 0.01103648 AA AA A ? rs317530 -0.009345899 -0.06389242 -0.3922845 0.5571331 1 1 AB BB B ? rs17039742 0.03041136 -0.01041109 -0.3715202 0.9953547 0.9941654 1 BB BB B ? The first line of the output file tells the column header. Each line contains tab-delimited fields, representing LRR for father, mother, offspring, then BAF for father, mother, offspring, then CNV-based genotype calls for father, mother offspring, and then the parental origin (F for father, M for mother, ? for unknown). You can probably load the output to Excel (use "separate by space") for easier visual depiction. Note that you can alternatively use runex.pl 13 and runex.pl 14 in the example/ directory in PennCNV to run the two types of analysis described in this page.